FULLCOURT GOLD DUNK HOOP by Ironclad Sports, Inc. 60" X 42" Tempered Glass Backboard. 6" X 6" Pole with 48" of Backboard Overhang. Galvanized AND Powder Coated - WILL NEVER RUST - GUARANTEED! Rim Lowers to 5 Feet. Clear-View Design. No Bars Behind the Backboard. Lifetime Warranty - Includes Dunking, Hanging and Structural Damage Caused by Rust. Galvanized AND Powder Coated - No Extra Charge for this RUST ARMOR package. BACKBOARD: 60" X 42" X 1/2" Tempered Glass Backboard. 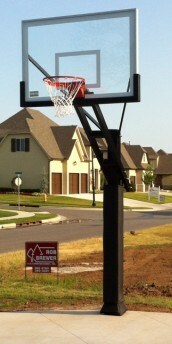 Clear-View design, no distracting bars behind the backboard.The backboard has a lifetime warranty against breakage during dunking because the rim is bolted directly to the pole system and not to the backboard. You don't have to worry if someone hangs on the rim. Free premium bolt-on backboard padding is included (170.00 value). POLE: ONE PIECE 6" x 6", massive 7 gauge square steel pole with 48" of backboard overhang. Galvanized then Powder Coated for a rust proof finish. 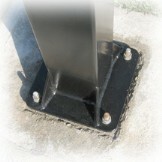 Removable bolt-down style pole system with included anchor system. Free premium pole and gusset padding is included ($280.00 value). ADJUSTABLE ARM: Spring-Assisted, Rear-Crank adjustable extension arm with 48" of extension from the pole. The rear crank uses a premium-grade worm-gear design AND a spring system for a very easy and smooth rim height adjustment. Adjusts from 5' to 10' with easy to read height indicator. The crank handle is lower to the ground so younger kids can easily crank it too. POLE: 6" x 6", 7ga Steel, Bolt-Down Base. FINISH: Galvanized AND Powder Coated Black. BACKBOARD: 60" X 42" X 1/2" Thick Tempered Glass. ARM EXTENSION: 48" From Pole to Backboard. ADJUSTMENT RANGE: Anywhere Between 5' and 10'. ADJUSTMENT SYSTEM: Spring-Assisted Rear Crank. SYSTEM WEIGHT: 620 lbs. (shipping weight: 642 lbs.). WARRANTY: Lifetime. Includes Dunking/Hanging and Rust. FullCourt Gold Installed in a Customers Driveway. We proudly use ABF Freight System, Inc. to ship our basketball hoops. North America's most trusted carrier, they provide our customers with Award Winning curb side service throughout the US and Canada. Free Lift Gate Service is provided where required. Shipping Weight: 642 lbs. in 3 cartons. DUNK HOOP! 6" X 8" POLE 72" X 42" REGULATION GLASS BACKBOARD with 48" BACKBOARD EXTENSION. INCLUDES FREE POLE , GUSSET and BACKBOARD PAD and FREE GIFT. CLEAR-VIEW BACKBOARD DESIGN!